Developed for processes ranging from cryogenic temperatures to 260ºC, and suitable for sealing virtually every chemical medium across the entire pH range (0-14). All our restructured PTFE (so-called filled PTFE) are FDA compliant which be able to use in food & beverage, pharmaceuticals and electronics industry. Uniflon 50 is a superior performance biaxially orientated PTFE sheet sealing material with highly comformable properties, idealy suited to standard and irregular flanges. Uniflon 50 is specially designed for sealing all chemicals across the whole pH, having service temperature at 260°C and pressure at 80 bar. It is recommended for using in low bolt loaded constructions, therefore extremely suitable for glass lined, ceramic, and plastic coated. Uniflon 51 is a superior performance biaxially oriented PTFE sheet material with a silica filler. Uniflon 51 is a general purpose grade for sealing applications across the whole pH range, having service temperature at 260°C and pressure at 100 bar. It is particularly suitable for using with strong acids (except hydrofluoric acid) and alkalis. Other applications include solvents, fuels, water, steam and chlorine. Uniflon 53 is a high performance biaxially oriented PTFE sheet material with a barium sulphate filler. Uniflon 53 is a general purpose grade for sealing applications across the whole pH range, having service temperature at 260°C and pressure 100 bar. It is particularly suitable for using with hydrofluoric acid, but not pure hydrogen fluoride. It can be used with alkalis, solvents, fuels, water, steam and chlorine. 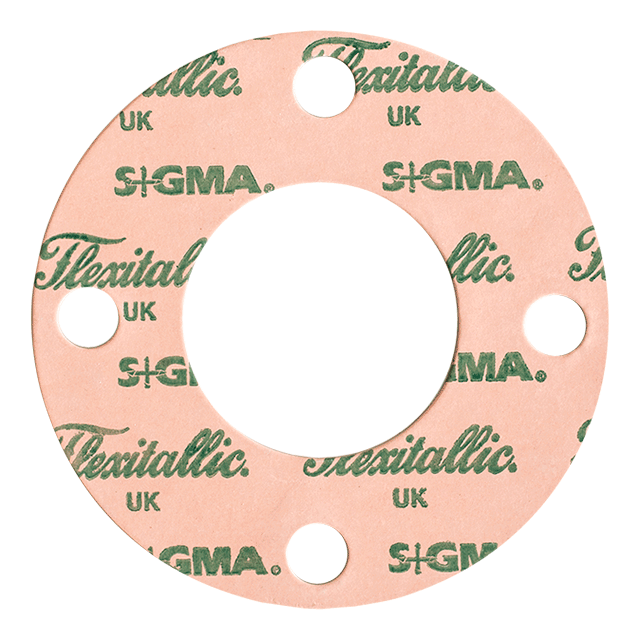 Flexitallic Sigma® 500 is fully restructured sintered PTFE based sheet sealing material ensuring maximum resistance to creep under the high compressive loads generated in bolted flanged connections. Compression is enhanced through the inclusion of silica microspheres. Its is particularly suited to sealing against a wide variety of aggressive chemical media such as strong oxidising and reducing agents, acids and alkalis. Inherently non-contaminating and FDA compliant the product is also suitable for use sealing against foodstuffs and pharmaceuticals. Compression enhancement results in a softer material with reduced seating stress properties enabling Sigma® 500 to be used in load compromised situations or where sealing contact surfaces may be damaged. Flexitallic Sigma® 511 is fully restructured, sintered PTFE based associated with virgin and filled PTFE based sheet sealing products. Flexitallic Sigma® 511 is incorporates a silica based filler system affording excellent chemical resistance to most commonly used mineral acids used in wide range of industrial processes, such as the manufacture of sulphuric acid and most common nitrate and sulphate based fertilizers. The material also has a proven track and approvals for use in cryogenic sealing applications; such as those found on air liquefaction and LNG facilities. As with the rest of the Flexitallic Sigma range the product has been engineered to be inherently non-contaminating and FDA compliant making product suitable for use in clean applications.